The highly anticipated premier issue of Hi Fructose is finally here. Attaboy and Annie just returned from Comic-Con and are ready to celebrate this momentous occasion with a special Release Party this Friday, July 22nd at Varnish Fine Art in San Francisco. Things will kick off at 8:00pm and it is a free event. Come on down and pickup a copy of this stunning new magazine before they are all gone. There will be artists signings and appearances from the following issue #1 alumni: Jennybird, Cookie Mongoloid, Brian McCarty, Annie Owens, Circus Punks, Alex Pardee, Attaboy & special guests. Entertainment will be provided by the one and only Kitten On The Keys! Laughing Squid is thrilled to sponsor this wonderful occasion. We are also the back cover advertiser. Our first magazine ad ever. 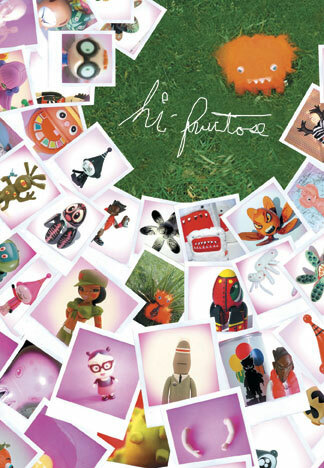 Hi Fructose, is a new full color quarterly magazine created for the toysploitation loving Under the Counter Culture. Hi Fructose is your ticket to the exploding Toy Arts Revolution and highlights the world’s renown and emerging artists, creators, and mischief makers who produce vinyl, limited run artist centered toys as well asa healthy serving of abandoned theme parks, culture jammers, and Japanese Monster Wrestling.